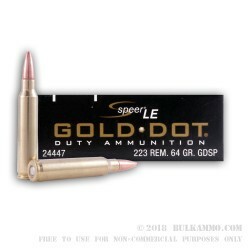 Speer Gold .223 ammo is a fantastic choice if you're headed into the woods or out on the plain with medium-sized game in mind. This Speer 223 Remington features a soft point bullet that's designed to expand upon impact with a soft target. That means an optimized wound channel to humanely and quickly bring down game like whitetail deer. The 64 grain weight is slightly heavier than what most of us would consider a "typical" AR-15 load. So, you might want to be sure your barrel will "play nice" with this heavier round and keep you on target. 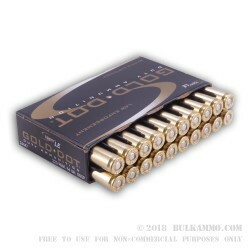 Made in the U.S.A, this ammo is of course non-corrosive and is loaded into factory new brass casings. Order this .223 Rem ammo today and you'll get a single box rounds delivered fast.